So, I’m sorry about that last post. The picture seemed perfectly clear to me! I knew that it was taken right in front of my kitchen sink and that the fabric bit was my new cheerful tea towel – how could I realize what a strange mystery tour I would lead you on? My Mom knew I had knit a rug, and even she could not figure out what it was in the picture. Bekah thought perhaps a foot would have clued people in. Ah, but the chances of me fixing up my toenails for a blog photo shoot were far out. I’d rather you all spend some time thinking that I make weird counter-top half doilies out of shredded sheets and pose them next to a piece of curtain. Yes, that would be much better! 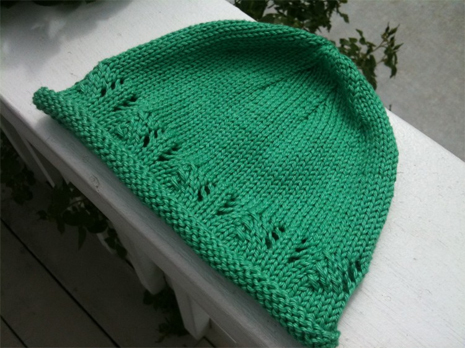 This time I knit a baby hat. Plain and simple – but I cannot say enough happy things about this yarn. I love it entirely. It is Cascade Ultra Pima – comes in a ton of wonderful colors, and tops off the happiness by being shiny. I got this yarn (and a bunch of other colors of it) right before I had Blaire. I was three or four days overdue at the time. Saturday morning my husband woke me up to tell me he was going to run grab some milk and stuff for breakfast before the kids got up (this is code for donuts). Then, he brought me his laptop and asked me to order some yarn while he was gone! Better than breakfast in bed! So I filled up my theoretical shopping cart with the cotton I had been eyeing all the way until he came back with tulips for me. It just doesn’t get any sweeter than that – and now I have some wonderful materials for some summer knitting. Seriously – yarn: the gift that just keeps on giving! I love it, the green is beautiful. Oh, and cute hat, by the way! I’m going to have to get my hands on some of that yarn! The pattern is precious! Where can I find it? awe, how sweet (the hat AND your husband!)!!! I wonder if you have a favorite place to order yarn on-line, and if you would share? You are so cute. I rather enjoyed the surprise that the doily was in fact a rug. : ) My husband has also gained a reputation for the morning doughnut run. All the kids know that if mom sends dad to the store in the morning for anything he will dependably come back with the surprise donuts. The fun thing is that everyone still acts surprised. : ) You just gotta love those little trifles. “thinking that I make weird counter-top half doilies out of shredded sheets and pose them next to a piece of curtain.” This seriously had me laughing out loud! What a cute hat! Do you have a pattern to share?